@N7 Trinity, hey same here bro! This reminds me of the whole story where the kid brings his cat to school because his dad told his mom he was going to eat it. @john freakin cena, or both. My five year old niece came to my crying because her older sister told her to "eat her socks". When asked, the older sibling was like "little sis, it's a phrase mining be quiet! Put a sock in it!" 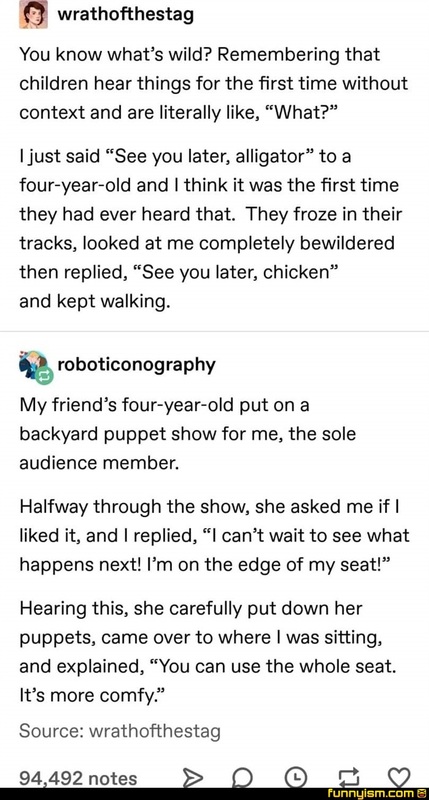 Nothing goes over a four year old's head. Their reflexes are much too fast. They would catch it!